When using sea-going equipment, the elements are invariably one of your greatest adversaries. Whether a researcher waiting for a weather window, or a technician maintaining a sensor platform, the waves and weather should never be underestimated as sensor equipment must endure these conditions. Wave buoys represent a considerable design challenge from multiple perspectives. Physical durability is clearly of fundamental importance, but that robustness must be extended into the functionality and performance of the wave buoy system. A wave buoy must also maintain operational independence over extended periods of time – measured not in weeks or months, but often years. The ToughBoy Panchax high precision wave buoy was developed by EIVA in 2014 to fit these requirements. With a dual power source ensuring data collection and transmission, it comes pre-calibrated and ready for deployment in rough weather conditions, with low service requirements and communication costs. To allow the ToughBoy to endure rough wave and weather conditions, it was built using tough materials. Stainless steel is used for the frame and counterweights, aluminium for the top, and polyethylene for the watertight, foam-filled, rotation-moulded shell body. The materials serve to securely house the sensors and prevent the wave buoy from sinking should it suffer a severe impact. The plastic shell not only offers important resistance to seawater exposure, but also reduces overall platform weight – a useful attribute for onshore transport. There are two versions of the system, one with a diameter of 1.2m and one with a diameter of 1.9m for deployment in deeper waters with more challenging wave conditions. The increased buoyancy reserve of the larger buoy, from approximately 70kg to 600kg, makes it possible to mount considerably more equipment within the buoy. The power system is based on two energy sources coupled by an intelligent power handling system (IPHS). The primary source is a system consisting of four 50W solar photovoltaic (PV) panels, a deep-cycle 1,200Wh, 12V Absorbed Glass Mat (AGM) battery (weighing 40kg) and two MPPT (Maximum Power Point Tracking) charge controllers. A 25,920Wh custom-assembled alkaline battery (120kg, non-rechargeable) serves as a secondary redundant energy source. The IPHS prioritizes utilization of the primary AGM battery whenever it can provide sufficient power to the buoy’s sensor data collection and processing system. Solar PV charging of the AGM battery is supported by the MPPT charge controllers. Figures 1 and 2: Charge cycle of the AGM battery (left) versus wave heights (right) over a period of days. The MPPT charge controllers also ensure the AGM battery is disconnected if the voltage dips below 10.8V DC, and reconnected when it is above 12.5V DC. In response to the connection state of the AGM battery, the IPHS will activate/deactivate the secondary battery via a custom high-speed MOSFET switching circuit to protect against power shortages. Analysis of the wave buoy’s performance over a 12 month period of operation demonstrated that the primary solar PV-based energy source is efficient enough that even over prolonged deployments in rough weather, the secondary energy source may not be required in areas with much solar irradiation (Figures 1 and 2). Reducing magnetic disturbance for more precise heading sensor data is a key consideration for sensor platform designers and numerous battery configurations were tested. An optimal configuration – in which the magnetic fields of the individual cells cancel each other out – ensured a fivefold reduction of the total magnetic field and an eightfold reduction of the magnetic field radiated around the top of the battery packet in comparison to a standard configuration. The standard sensor payload features a Teledyne Workhorse Monitor ADCP with bottom tracking and an EIVA wave sensor, alongside a GPS unit. Depending on the sensor configuration and current conditions, up to five extra sensors can be fitted onto the buoy. The entire wave buoy is pre-calibrated and as such is delivered mission-ready. To allow communication, the wave buoy can transmit the sensor data to EIVA servers via standard communications protocols (GSM/3G/HSDPA/GPRS). The buoy also comes with an Iridium transceiver pre-installed (this requires a separate Iridium subscription), alongside UHF as an additional communication option. If the wave buoy is moved beyond a predefined geographic zone an alarm is triggered, reducing the risk of the buoy suffering damage or being lost. The buoy also has AIS transmission capability allowing AIS receiving vessels within range to pick up the data streams and gain insights on local wave and current conditions. The operating firmware of the ToughBoy plays an important functional role in supporting energy efficiency and ensuring transmission costs are kept at a minimum through the implementation of onboard data processing (e.g. wave data). The integrated EIVA wave sensor outputs raw data at 4Hz for calculation of ten output parameters, not all of which are immediately relevant to most users. Sending everything back to shore would be costly in terms of both power consumption and bandwidth. Instead, onboard processing enables raw sensor data to be run through custom algorithms which output only the most significant and meaningful insights on wave conditions. Once the calculation is finished, the transmission system is powered up to deliver the data via the communications protocol with the highest priority (set by the customers). Figure 3: Significant wave height versus maximum wave height over a period of several months. The wave buoy is combined with ToughBoy Onshore – EIVA’s web-based service. 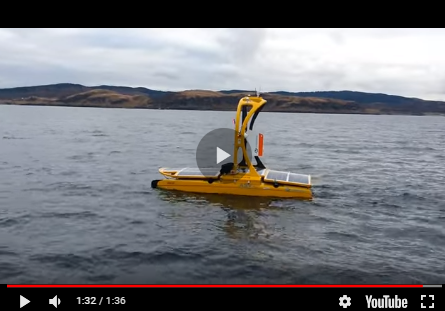 As well as delivering sensor data to EIVA servers accessible to customers, the software allows for the remote configuration of the wave buoy; enabling adjustments to how the buoy transmits data, what data is sent, and the transmission intervals. ToughBoy Onshore also allows EIVA technicians to remotely check the status of the CPU and battery conditions. In the near future, the Onshore software will also support real-time and historic visualization of all data gathered by ToughBoy sensors. Wave buoys are used for various applications, one of which is site monitoring during offshore wind farm construction. Wind farm specialist WPD deployed a ToughBoy Panchax two months ahead of the construction of their Nordergründe wind farm, while keeping another one on standby for the duration of the project. Located 16km from shore with slightly more challenging water conditions, in the estuary of the German river Weser, a total of 18 wind turbines with a total capacity of 110.7MW were to be installed. In this industry, it is essential for contractors to know when they can work on the site. Therefore, limited to no downtime, along with secure and uninterrupted data gathering and transmission are primary concerns, as the cost of even a single day’s delay is significant. The deployed ToughBoy was fitted with a 1,200kHz Teledyne Workhorse Monitor ADCP with bottom tracking, suitable for measuring currents at the site’s 2.5-10m water depth. In order to secure continuous data transmission, as well as reduce costs and man-hours as data retrieval would not have to take place through a team going to the site, WPD opted for an Iridium data subscription. With the ToughBoy’s internal CPU processing the acquired wave and current data on site, the resulting data protocol being sent to shore via satellite is highly compact and thus cheap to transmit. Real world deployments have also shown that the platform was unaffected by storms and waves up to seven metres (Figure 3). Key to this capability is the mooring technology consisting of a heavy stainless steel chain, fixed to a clump weight on the seabed. A Kevlar safety rope connects the chain with a length of heavy rubber cord for the upper 15 metres of the mooring system. This rubber cord provides the necessary slack to allow the buoy to ride wave movements on the surface thereby securing accurate wave data collection (Figure 4). Figure 4: Significant wave height comparison between wave buoy and bottom mounted ADCP for accu-racy confirmation.